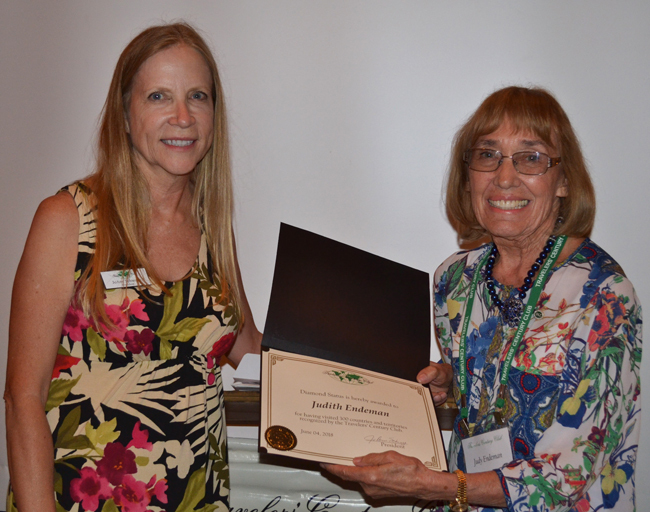 President JoAnn Schwartz presents a certificate to Judy Endeman recognizing her Diamond 300-destination accomplishment. 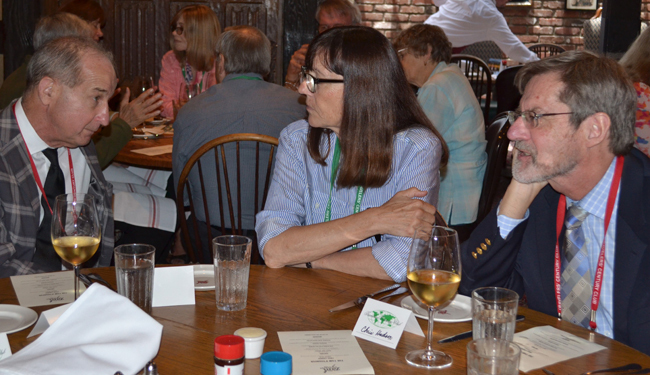 More than 50 TCC members and guests applauded their colleagues who achieved new destination levels during the Charter Chapter (Southern California) June luncheon at the historic Tam O’Shanter Inn in Los Angeles (see more photos below). TCC President JoAnn Schwartz bestowed a Diamond-level pin and certificate to Judy Endeman upon the achievement of visiting her 300th country/territory. Similarly, 250-level award recognition was given to Dr. Sunny Vazquez McMullen and Richard J. McMullen. Margo Bart, visiting from Northern California, presented a fast-paced tour of Eastern Europe which she undertook last year with President JoAnn as her travel companion. The two started their trip in Albania and visited countries that were formerly part of Yugoslavia and the USSR. 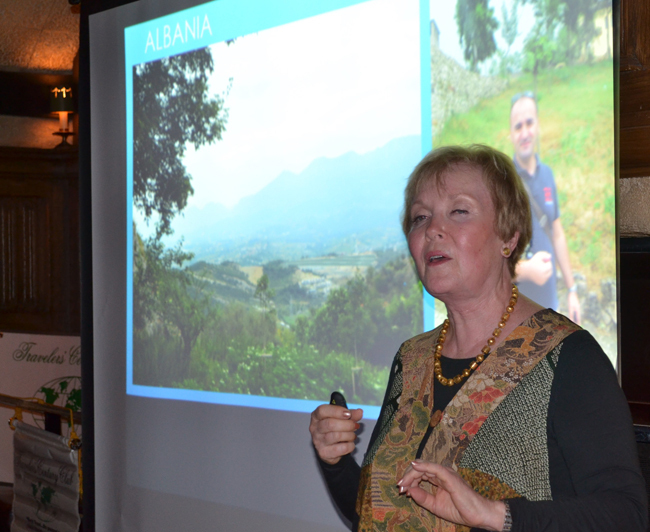 Margo’s colorful presentation included some offbeat places on TCC’s list, namely, Srpska and Transdniestra. Dr. 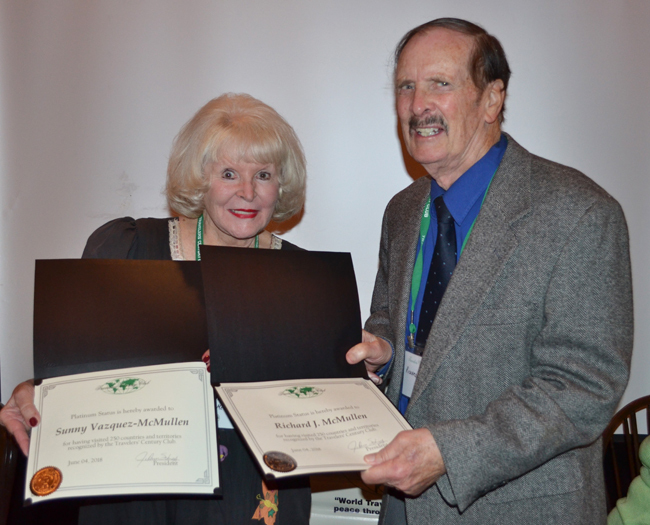 Sunny Vazquez McMullen and Richard J. McMullen are honored upon achieving Platinum 250-country status. With the Albanian mountains as a backdrop, Margo Bart begins her expansive Eastern European travel program. New Provisional Member Denise Feathers Dukoff gets the full TCC briefing from board members Steve Fuller and Chris Hudson. 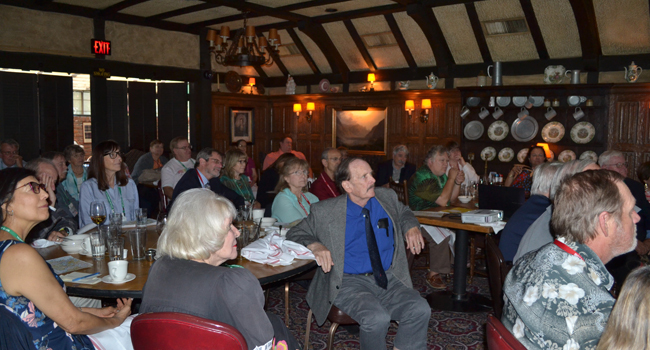 Part of the overflow crowd of 52 attentively following the presentation at Los Angeles’ historic Tam O’Shanter Inn.